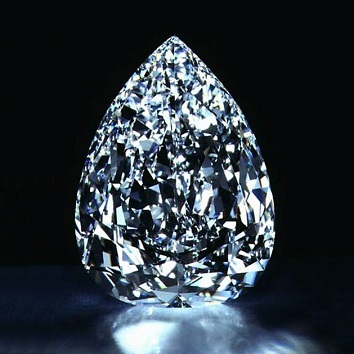 Cullinan is the largest diamond which has ever been found. Its size is compared to a grapefruit. It was found in South Africa in 1905 and got its name after Thomas Cullinan, the founder of the mine. Its weight in raw state reached fabulous 3,106 carats. In this form however it does not exist any more, as it was cut into 105 parts later. 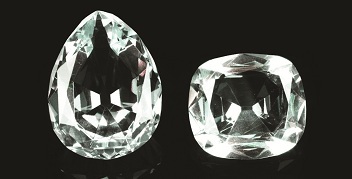 The two largest stones, Cullinan I (530.20 carats) and Cullinan II (317 ct), form the part of the English Crown Jewels. It is probably the second largest unearthed gem. This highly pure blue-white stone was found in l893 by a South African mine worker. The rough diamond weighed 995.2 carats and was of rather unusual shape - it was flat on one side and sharp on the other. Excelsior was cut into several parts. Three large pieces weighed 158, 147 and 130 carats. The smaller pieces were from 70 to 1 carat. The total weight of the diamonds so created was 373.75 carat, which means that the loss by cutting and grinding was 63% of the weight. Why was it decided to cut such a large and beautiful diamond into pieces, remains unclear. The resulting diamonds are named Excelsior I, Excelsior II, etc. 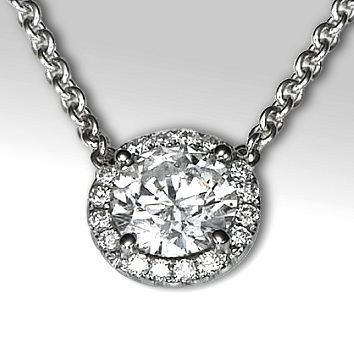 These diamonds were sold separately. Some of them were bought by Tiffany and Co., other ones were allegedly purchased by De Beers. Big Magnate is the world's third largest gem stone in the quality of diamond. It got its name after the early deceased wife of Mughal Emperor of Shahjahan Territory of India. The stone was found in the middle of the 17th century. Where the diamond is now, it is not known; while such opinions can be heard that it had been cut into smaller stones long time ago. KOH-I-NOOR in translation means "Mountain Of The World". History of one of the most famous diamonds is pretended to be interwined with human fates for two thousand years already. But with much more confidence we know that it was in the possession of Indian and Persian rulers since the 14th century. It came to England in 1850 as compensation for the East Indian Company, which donated it to Queen Victoria. She got the diamond brushed and gave it as a present to a wife of British Monarch. Queen Elizabeth had it set into the royal crown in 1936 and it is guarded in London together with the other British Crown Jewels till today. 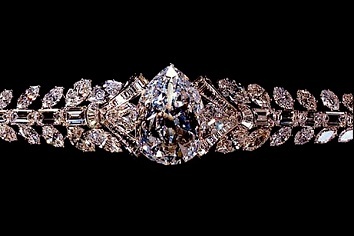 De Beers Millennium Star is according to some experts the most beautiful diamond that can ever be seen. It was found in Congo in the eighties of the last century and its shaping took more than three years. The result is a 203 carat stone, which is so perfect that it is practically impossible to quantify its value. The diamond HOPE is storied with the probably most dramatic legend. It is preserved in the Smithsonian Institute in Washington. It was discovered in India, where it was later in the 17th century bought by the French traveler Jean Baptiste Tavernier, who sold it later to King Louis XIV. Tavernier paid off his family debts with the money obtained and set back for India with a vision of another bargain. But no happiness expected him there, because a pack of dogs tore him apart. 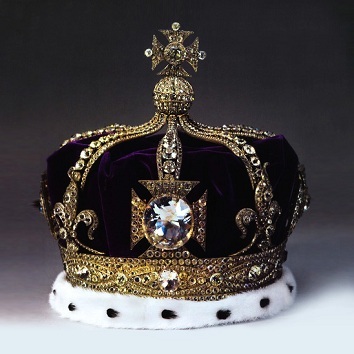 The stone formed a part of the French crown jewels, but it did not bring much luck to the royal dynasty of Bourbons. During the French Revolution not only that it disappeared, but the king Louis XVI together with his wife Marie Antoinette were executed. The Diamond appeared for re-brushing in Amsterdam later. But the grinder's son stole it, who under the weight of responsibility for the death of his father committed suicide. 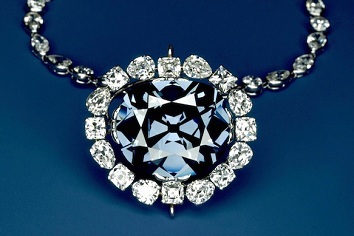 In 1830 the diamond was gained by a wealthy merchant Henry Hope. But the curse chasing the owners of the stone hit his entire family, so the diamond was sold again. Various disasters victimized also further owners. Finally, American jeweler H. Winston acquired the diamond into his ownership and donated it to the Smithsonian Institute.